Robert Woodhead Limited attended the Apprenticeship Fair at Dukeries College of Further Education on Thursday 14th March 2013. The Fair was attended by approximately 350 young people interested in apprenticeship opportunities across a range of industries. Robert Woodhead provides apprentice opportunities across the East Midlands on a wide variety of construction projects including specialist conservation works, school refurbishments and highly sustainable new build developments. Apprenticeships are a unique concept of learning a profession in the workplace and an effective means of developing talent. They offer a viable alternative for people looking for a direct and affordable route to skilled jobs and careers. This means we can pass down the skills and knowledge from our most able workers to incoming or existing employees, keeping our skills in-house and passing them from one generation to the next. A report by the Centre for Economics and Business Research showed that apprenticeships are forecast to contribute £3.4bn a year to the economy through productivity gains by 2022. The number of people completing apprenticeships is predicted to increase from 260,000 in the current financial year to 480,000 by 2022, said the report. Robert Woodhead is committed to providing apprentices and has in recent years provided hundreds of days of structured training to apprentices and students wishing to start a career in construction. 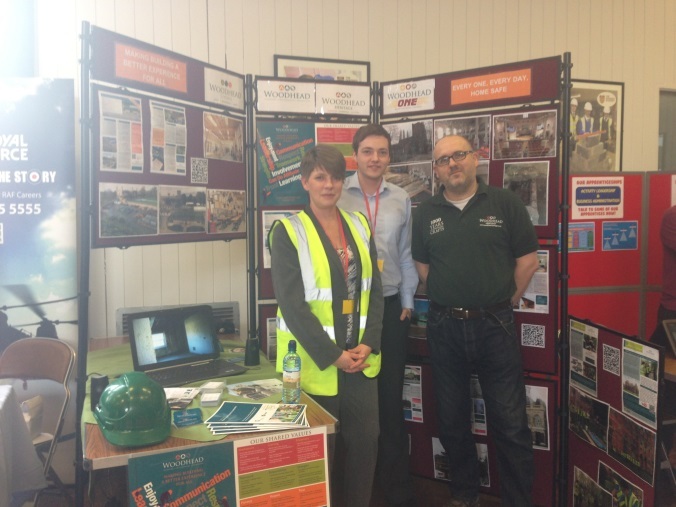 Other exhibitors included the RAF, Construction Skills, and Newark and Sherwood District Council.